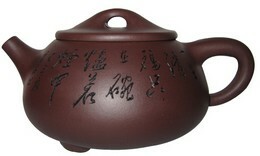 How to appreciate and buy a Yixing Chinese tea pot for gongfu tea brewing. The best way to think about it is to use the analogy of a magnifier. Once seasoned, it amplifies the desirable quality of your favorite tea and rewards you with cup after cup of delicious-tasting beverage. It requires almost no maintenance, and gets better over time. If you have the eyesight of a superman, you may be able to zoom into Yixing clay's miraculous molecular structure. 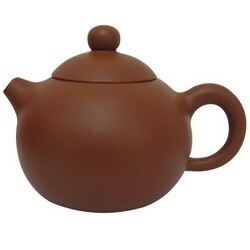 You would see that the clay is porous - the surface area is many times larger than the size of the tea pot. Each time you steep a tea, the clay absorbs 4% of the water. It becomes "seasoned" when it has absorbed the chief characteristics of your favorite tea. When your tea pot becomes seasoned, it tastes good even by itself. I usually drink plain water out of my Yixing cup, because it tastes so good! The tea pot is recommended for brewing highly oxidized teas (roasted oolong, black tea, old pu-erh) with strong body but light aroma, but it can also be used to brew green tea, white tea and aromatic oolong. Now imagine again you are a superman again. Using your fantastic eyesight, you would detect more irregularities in the clay. You would see it contains tiny amount of iron, quartz, mica and other minerals. When you brew a tea, you automatically enrich the water with minerals. Also, the lid has a small pore on top so that your tea can breathe easily. The combination of past brewing "memory", minerals and air makes your tea tastes great. Not only that, it lasts more infusions - saving you money. The clay has low thermal conductivity. This means it retains heat well and is not too hot to touch. The clay has low shrinkage rate. The lid can be made to fit tightly to the mouth. What this means is that high temperature brewing is surprisingly effective. It is for this reason that Yixing pottery sits at the apex of tea world, prized by avid collectors in China, Korea, Japan and Taiwan. Not only is the clay enriching, the manufacturing process is also safe. The next time you consider buying a handmade ceramic ware directly from China - think again. A porcelain ware such as a gaiwan (tea bowl) usually contains lead glazing. Individual artist would not have precise control over the kiln temperature. Your ceramic ware would look nice, but your tea may be poisoned by lead. Although Yixing comes from China, it is totally safe. The clay contains naturally occurring iron, which can be mixed and fired to create various color effects. There is no need for glazing. It does not contain any lead, arsenic, cadmium, and other toxic materials. No chemicals or other additives are added. Getting a Chinese tea set is not just about brewing tea, it is also an intensely tactile experience. The clay is pleasant to touch. Although the surface appears grainy, the clay feels smooth. When you buy a Yixing, you are not just buying a vessel. You are making a connection to the artist and maker. When making porcelain ware, division of labor is the norm. Each team specializes in its own processes. Making clay pottery is different. The same person is involved from start to end. Therefore each item is closely linked to the artist. There are hundreds of pot designs? Which do you choose one? Practicality considerations aside, the pot's design should speak to you in the same way. A well-made pot is beautiful. It is well-proportioned, smooth and gets shinier over time. Maintenance is simple. Never wash your tea pot with soap or cleanser. After each use, rinse with water and remove the leaves. Then leave to dry or wipe gently with cloths. What does your touch sense tell you? Is it practical and fit for purpose? What does the calligraphy and seal tell you? What tests can you perform to assess the quality of your ware? 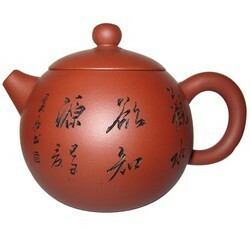 A great pot for beginner, this attractive design is named after the most beautiful woman who ever lived in China - Xishi. 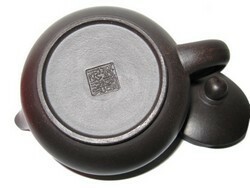 The handle is inverted, which is why the style of tea pot is called Daoba Xishi. This pot is made from a special clay called Xiaomeiyao - a red clay (Zhuni) extracted 500 meters away from the Yellow Dragon Mountain. 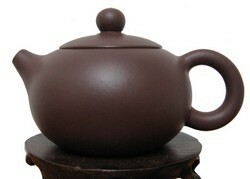 It is excellent for brewing aromatic oolong tea, especially a high grade Iron Goddess. It holds and dissipates tea aroma really well. This stunning pot is larger (350 milliliters) and made from a special purple clay called Qingshuini (清水泥), which means Clear Water Clay. It is orangey brown in color. The calligraphy has been engraved. 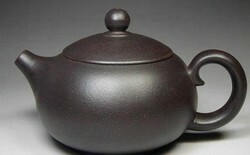 There are three types - purple clay, red clay (hongni, zhuni) and green clay. So, you are the proud owner of a brand new tea pot. What now? A step by step guide on how to season a purple sand claypot.